Hollywood duo Josh Hartnett and Ben Affleck portrayed the American desire to avenge the infamous Pearl Harbour bombings playing two US pilots in Michael Bay's hit 2001 epic. 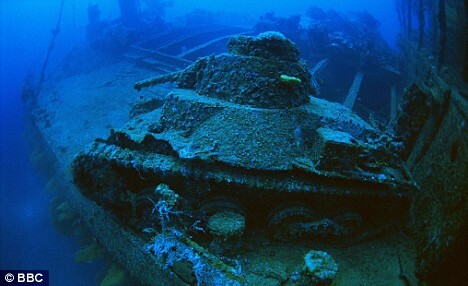 But, the true devastation of the revenge attacks on Japanese forces in 1944 has been captured in one of the most ambitious underwater projects ever undertaken. Operation Hailstorm was two years in the making - but on February 17, 1944, American forces blitzed the Chuuk Islands, in the south western region of the Pacific Ocean, sinking 70 Japanese ships, 270 aircraft and killing close to 3,000 people - though the official death toll has never been confirmed. And commissioned by the BBCs Natural History Unit, a 30 strong team of divers, deep sea biologists and under water cameraman explored remotest depths of the Pacific to unravel some of the secrets behind the America's revenge attacks.